THESE PLANTS SHIP FROM OUR GROWER IN CALIFORNIA. SHIPPING INCLUDED IN THE PRICE. 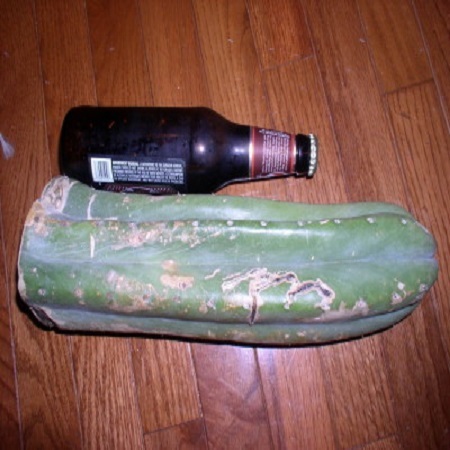 The Tom Juul’s Giant or simply Juul’s Giant is a cultivar of trichocereus pachanoi that is known for fat stems and almost non-existent spines. 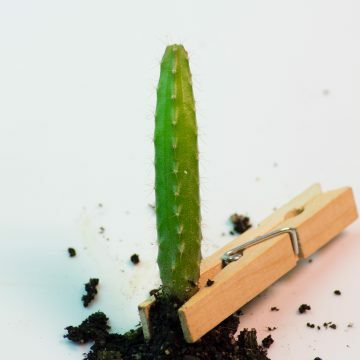 While the Backberg clone (the predominant cultivar) of trichocereus pachanoi is already known to have very small spines, those of the Juul’s Giant are distinctly smaller. The Juul’s Giant is a highly coveted cactus that should be in every serious collector’s collection. 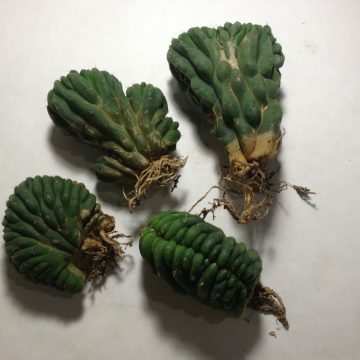 We are proud to be able to offer 12″ tip cuttings of this prized cactus. All cuttings will be shipped from our farm out west where they can grow nice and fat. Trichocereus Pachanoi is perhaps the most famous of the trichocereus species. This easy-to-grow, ornamental, columnar cactus is popular for a variety of reasons. It is a sacred symbol with a long history of sacramental use amongst the various peoples of its native habitat, which stretches from the Andes of Peru to Bolivia to Ecuador. 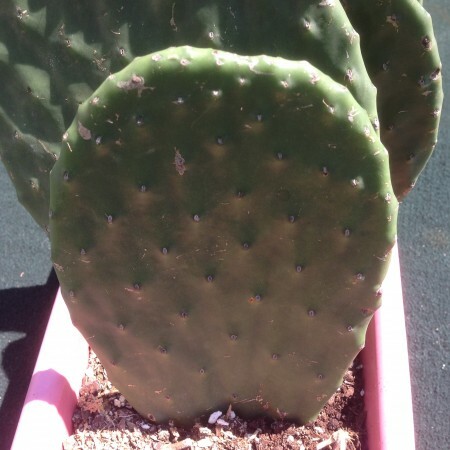 A common landscaping cactus, pachanoi is also tolerant of a wide variety of conditions and can handle more water and fertilization than most cacti, making it a good species for beginners. Its small spines also make it easier to handle for those who are not experienced with dealing with sharp spines or those who have curious kids or pets that may be injured by larger spines. 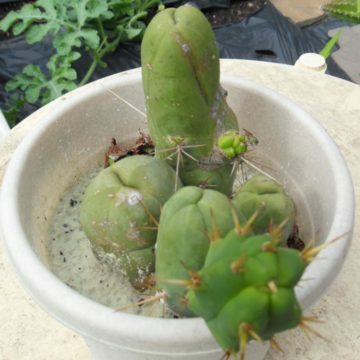 Additionally, it is a rapid grower, making it a favorite grafting stock for speeding up the progress of slower-growing cacti such as astrophytum and ariocarpus. Under ideal conditions, San Pedro can grow up to 18 inches per year and will readily shoot off new pups (branches). Frost hardy to about 26 degrees Fahrenheit, these cacti can be raised outdoors all year in Zone 9 or warmer. Otherwise, it should be kept in medium to large pots that can be moved inside during the winter months. Plants can be watered frequently during the summer months, sometimes as often as every two days if the top inch or two of the soil is dry. During the winter, they should be slowly acclimated to cool, dry, dark conditions to avoid stretching that could damage the aesthetics and structural integrity of the plant. When breaking dormancy in the spring, a reverse process of slowly introducing the factors necessary for growth may be beneficial for the same reason. 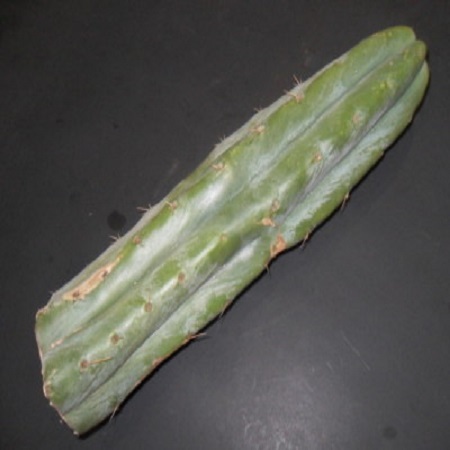 For optimal skin color, trichocereus pachanoi should be kept in partial rather than full sun and the soil should be well-draining and rich in organic nutrients and minerals. Its blooms are large, white and have a strong, pleasant perfume.